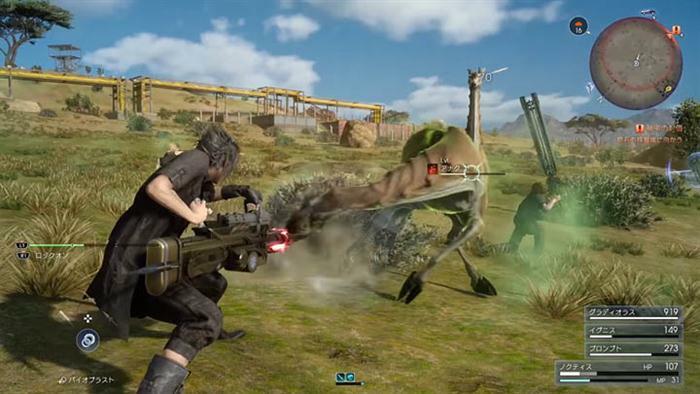 The Bio Cannon is one of Final Fantasy XV's hidden weapons which is exceedingly good during boss fights and a lot of fun to use. In this guide you'll find exact details on this weapons hidden location, including steps to find and collection the weapon for yourself. Although I refer to this weapon as the Bio Cannon, it could easily be referred to as a Plasma Cannon, Charge Rifle, Lazer Blaster or anything along those lines. In essence, it's a chargeable weapon that fires a concentrated beam of energy once the player has held down the trigger long enough to warrant a shot. It also has a secondary gas attack which causes AoE damage to foes in the nearby area. The image above shows the exact map location for the Bio Cannon. 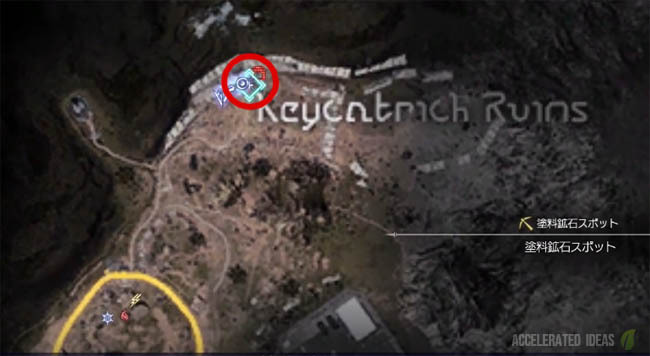 It's located in the North Western area, just north of Wenverwilds where the map says: "Keycatrich Ruins". This area appears to be an old mining region, scattered with ruined buildings and a huge wall encompassing the area. Follow the narrow route north and around the western side, hugging the large wall until you reach the structure shown in the image above. This structure consists of several metal beams protruding from the ground and several brick pillars surrounding them - like a ruined building. 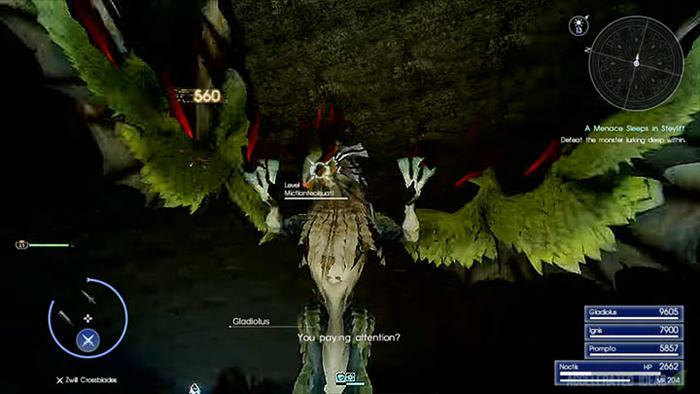 You should see a yellow mining symbol on the map by now. With the wall to your left and the ruin on your right, continue heading north towards the large rocks. Keep climbing onwards until you find the cave entrance shown in the image above - it appears as a red icon on the mini-map. To the left of the entrance and up on top of the rocks is the Cannon weapon. Simply walk up to the weapon and pick it up. Now open the menu and assign the Cannon weapon to one of your empty weapon slots. Now wait for combat and select the assigned slot to start using the weapon for yourself. The Bio Cannon has two forms of attack. Pressing triangle whilst holding the Cannon causes Noctis to spread a cloud of poisonous gas in the nearby vicinity. This is useful for killing enemies in close range, possibly in situations where the large number of foes makes it difficult to single out one enemy at a time. The other form of attack is the beam of energy, which I would consider more as the primary attack for the Cannon. Holding down the fire button causes the Cannon to charge before releasing a powerful beam that hits multiple enemies caught in the line of fire. Very strong and great fun to use!